OSWEGO — The Oswego County Historical Society will host the 32nd annual “Not So Silent Auction” on April 5 from 6 – 8:30 p.m. at The American Foundry, 246 W. Seneca St. in Oswego. 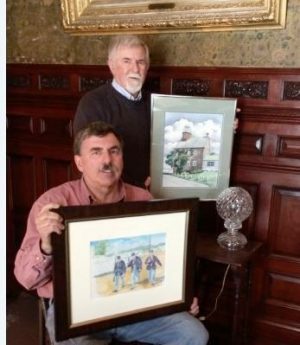 From left are Gerald Petro, event antique appraiser and Ted Sivers, event auctioneer, as they admire a framed watercolor painting of the Selkirk Lighthouse in Oswego County painted by late Oswego artist Jeanne Kraft. Also being admired is a Civil War watercolor print by Don Gillespie and a unique Waterford crystal lamp. Ticket donation is $20 and will be available for purchase in advance and at the door the day of the event. The silent auction committee volunteers have been diligently seeking support for this year’s event. All proceeds will go toward the operating support for the society’s historic Richardson-Bates House Museum. Listed on the National Register of Historic Places and part of the Washington Square Historic District, the Richardson-Bates House is a rare example of a 19th century Tuscan Villa. Efforts are regularly being made by the historical society board of trustees and volunteers to raise the needed funds to complete additional restoration projects on the interior. A very generous recent contribution from the city of Oswego was received to assist with the roof repairs surrounding the skylight. Interior work will be made through funds raised through the society’s fund-raisers, including this year’s auction. 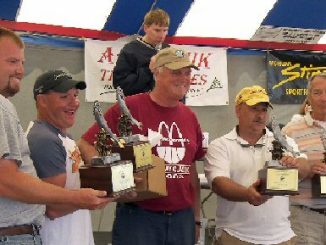 A popular addition to the silent and live auction portions of the event has been the antique appraisal and it will be featured once again this year. Every admission ticket will include one free antique appraisal by Gerald Petro of Iroquois Auctions in Brewerton, N.Y.
Additional appraisals after the first free one will be $5 each. This will be donated to the OCHS. Professional auctioneer Ted Sivers will also conduct the live auction of special items. Among the many unique donations for bid will include a watercolor painting by the late Jeanne Kraft, who was a well-known artist that resided in Oswego throughout her life. Kraft was a graphic designer for more than forty years with Sealright Corporation, and was a talented artist of watercolor paintings including recognizable scenes around the Oswego area. The watercolor painting is of the popular historic landmark Selkirk Lighthouse, which is located in Port Ontario of the town of Richland in Oswego County. A wide variety of gift certificates, antiques, home goods, collectibles, artwork and more will be available for bid. A traditional Chinese auction will be featured with chances to be offered for a dozen themed-filled gift baskets. The Oswego County Historical Society is a non-profit organization dedicated to the preservation and promotion of the county’s rich historic past. It operates the Richardson-Bates House Museum located 135 E. Third St. in Oswego. The museum is open from April to December on Thursday, Friday and Saturday from 1 – 5 p.m. and other days by appointment. Anyone wishing to help sponsor the cost of the event, make a donation of quality items for the auction, or would like to purchase tickets in advance, may call the museum at 315-343-1342.